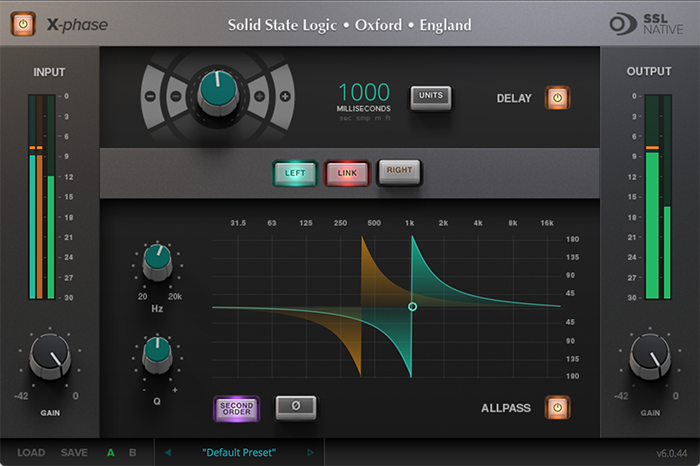 SSL Native plug-ins provide the precision, advanced feature set and legendary tonal characteristics of SSL audio products in affordable plug-in form. The complete SSL Native plug-in collection is available on a monthly subscription via Gobbler or the plug-ins can be purchased outright from the SSL Web Store. SSL Native plug-ins require a physical iLok 2 or iLok 3 USB dongle for authorisation. 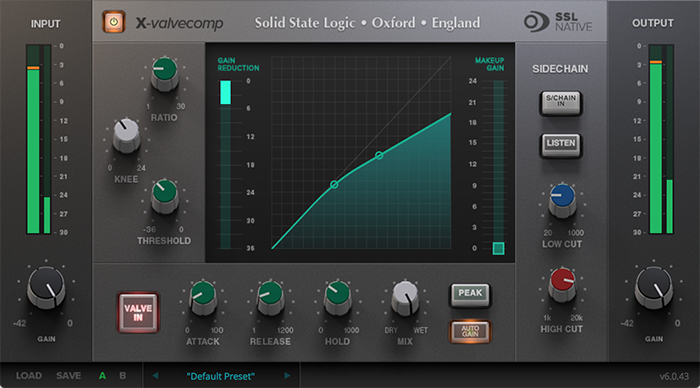 Classic SSL console EQ and Dynamics Processing for your DAW. The SSL Native Channel Strip delivers the legendary tone and features of an SSL console channel strip. The EQ is a classic 4-band design with parametric LMF & HMF sections and shelving LF & HF sections (LF & HF switch to Bell). 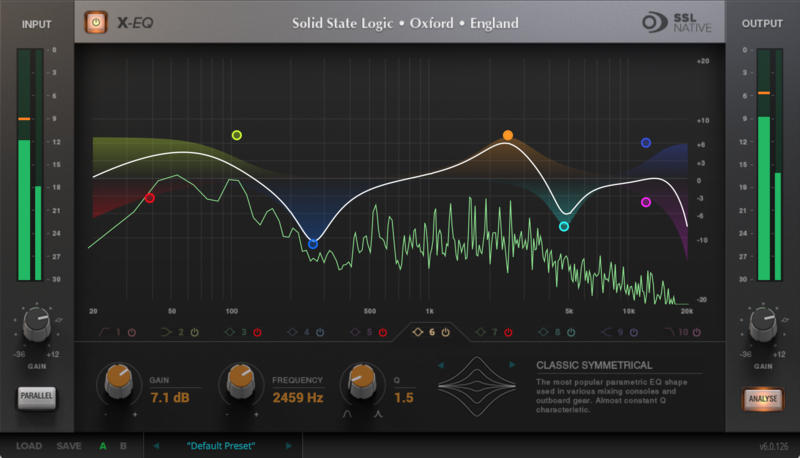 The whole EQ can be switched between E & G Series characteristics and can be applied to the dynamics side chain. The Dynamics section offers separate Compressor and Gate/Expanders. The Compressor can be switched between soft and hard knee. Both the Compressor and Gate/Expander sections feature fast/slow attack switches and independent side chains. The plug-in also features High and Low Pass Filters which can also be applied to the side chain. The sound of the legendary SSL Stereo Bus Compressor. The centre section compressor from SSL’s 1980’s G Series analogue console is an audio production legend. It is the secret behind countless classic recordings. It is a simple unit with a simple purpose; it makes complete mixes sound bigger, with more power, punch and drive. It brings cohesion and strength to your mix without compromising clarity. "Sticks your mix like audio glue." - That's how we often hear the SSL Stereo Bus Compressor described, along with - "You strap it across your mix - and it sounds like a record." We could wax lyrical about the technology - but hey, you already know how great this thing sounds - you've heard it on countless hit records from the last three decades. 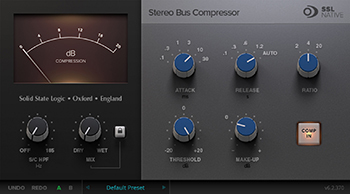 The Dec 2018 SSL Native v6.2 software release adds two new features to the SSL Native Bus Compressor; a Dry/Wet mix control and side-chain High-Pass Filter. The Dry/Wet mix control blends between compressed and uncompressed signal, allowing quick and easy parallel compression without using additional busses. The addition of the side-chain high-pass filter allows for reduction of the amount of low frequencies in the audio that is triggering the compressor so reduces unwanted pumping effects. Simple, powerful, intuitive and rich. FlexVerb is a brand new fully-featured and extremely versatile SSL reverb plug-in designed to deliver a professional mix-ready sound in a quick and intuitive way. FlexVerb’s versatile split early-late reflection interface allows you to add the natural body and tone of different early room reflections, complimented by the richness of a variety of expansive reverb tail options. FlexVerb features a 6-band EQ, High and Low Pass Filters, 3-band reverb time multipliers and input sidechain compressor to help you craft reverb that sits perfectly in your mix. FlexVerb’s algorithmic architecture gives you the depth, character and detail of a professional reverb in a simple rewarding interface. Four Reverb Types: Room, Hall, Plate, and Chamber. Early & Late Reflection types can be independently selected; for example, Small Room Early Reflections, with a Large Plate Reverb Tail. 6 Band SSL EQ, with 3 bands of reverb time multipliers. Output compressor (applied to reverb only) side-chained by the ‘dry’ input signal; useful to help sit the reverb in the mix. Lockable Dry/Wet Mix control; fix the mix of dry and wet signal when switching between presets. The simple path to better drum tracks. The secret to making an average drum recording sound incredible can be elusive. It takes the right combination of processors, with the perfect sonic character, in the correct configuration and tweaked in the right way. Drumstrip takes drum sounds from ordinary and average to vibrant and exhilarating in a few quick, easy steps. Plug in, switch on and experiment. Drumstrip handles the hard part; putting the right selection of fantastic sounding processing tools in your hands in an instant. With Drumstrip, DAW users can attain increased presence, clarity and detail in their drum tracks; reduce spill in individual tracks; restore natural brightness; achieve greater perceived loudness; shorten or lengthen the attack and sustain of percussive signals; tighten up booming toms; make kicks and snares stand out in a mix; and parallel compress room mics. 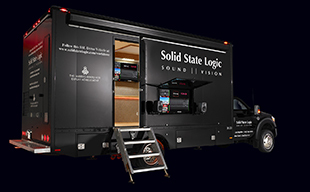 The fast track to a professional vocal sound. Vocalstrip is an application specific plug-in that draws upon decades of SSL professional engineering expertise to combine the right four processing elements to create the simple route to professional vocal recordings. Combining EQ and dynamics sections with essential vocal processors, Vocalstrip aims to bring power, character and clarity to vocal tracks from a single interface. Vocalstrip solves the challenges of producing great vocal recordings with four processing tools carefully selected and calibrated to deliver great results every time. Analogue style edge for your digital recordings. 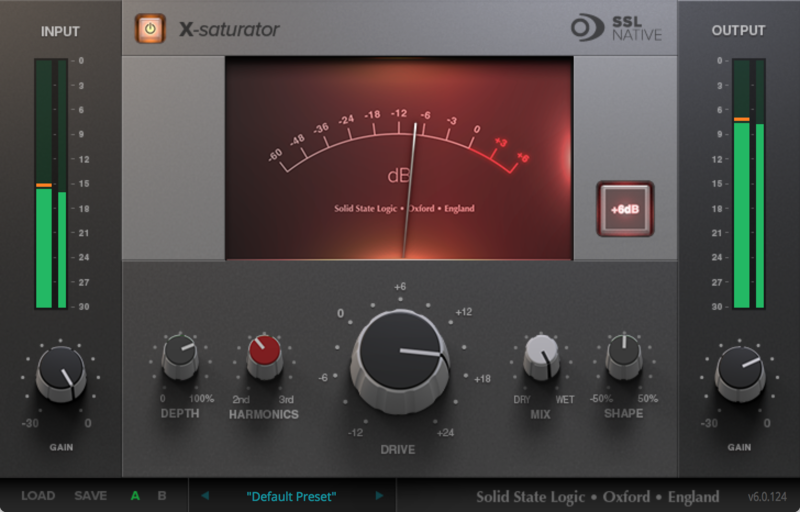 X-Saturator delivers a stunning range of analogue style distortion effects. It is an emulation of an analogue circuit that introduces either 2nd order valve style or 3rd order transistor style distortion or a blend of the two. At low drive settings the distortion is mild and can add gentle warming to help instruments sit nicely in a mix or to add a little extra edge to help instruments cut through a mix. As drive levels are increased so too is the level of distortion until at high drive levels heavy distortion occurs. The controls are simple: a Harmonics control selects 2nd or 3rd order distortion or a blend of the two, a Drive control sets the drive level, a Depth control the amplitude of the distortion and a Shape control adjusts whether the distortion has smooth or hard edges. A Headroom button provides an additional 6dB of headroom for creating heavily boosted/distorted signals without digital clipping. A dedicated wet/dry mix control facilitates parallel processing. There are Input and Output Meters and Input and Output Level controls. X-Saturator can be automated via standard DAW Automation data and has A&B Preset 'slots' with an A/B switch for easy comparison of two different combinations of settings. X-EQ is an open and transparent sounding parametric EQ that provides the user with a truly comprehensive range of EQ tools within an intuitive user interface. X-EQ is exceptionally flexible with the ability to be surgically precise for mastering duties or to smooth and sculpt for everyday audio production and is particularly suited to real time manipulation for dramatic filter sweep effects. X-EQ is at first glance a 10 band parametric EQ, but each of the 10 EQ bands can be selected to provide a different type of EQ, making X-EQ a vast range of different EQ processors in one package. Bands 1 and 10 are High and Low Filters, each of which can be set to employ one of five different Filter topologies with five very different tonal characters. Bands two and nine are shelving EQ’s with a Q range that extend right up to 10.3 and a degree of undershoot and overshoot at higher Q settings that give a unique tonal character. The remaining six bands are all Bell EQ’s with a choice of nine different EQ types providing a comprehensive range of response curves. All Shelving & Bell bands can operate across a full 20Hz-20kHz frequency range with a powerful gain range of +/-20dB. All of the Bell bands can also be switched from the usual serial signal flow of a parametric EQ to the parallel signal flow of a graphic equalizer. X-Comp is a sophisticated and extremely versatile stereo compressor that cuts through the mass of freeware and bundled plug-ins available with genuinely professional features, results and interface. The audio performance, specifications, analysis tools and depth of control offered by X-Comp are exemplary. It delivers mastering grade audio fidelity with a distinctly analogue feel and can be used for everything from ‘invisible’ subtle dynamic control for mastering, to dramatic ‘brick wall’ effects that inject raw energy and power that competes with the legendary SSL Listen Mic Compressor. Between these two extremes X-Comp can reproduce the characteristics of a wide range of modern and classic vintage compressors. In X-Comp we haven’t just modeled a particular compressor, but have provided a set of features and controls that allow the emulation of a broad range of compressor designs. The fully featured channel compressor with added grit. X-ValveComp is a fully-featured mono or stereo channel compressor with a full set of classic channel compressor controls and an added 'valve' emulation stage. 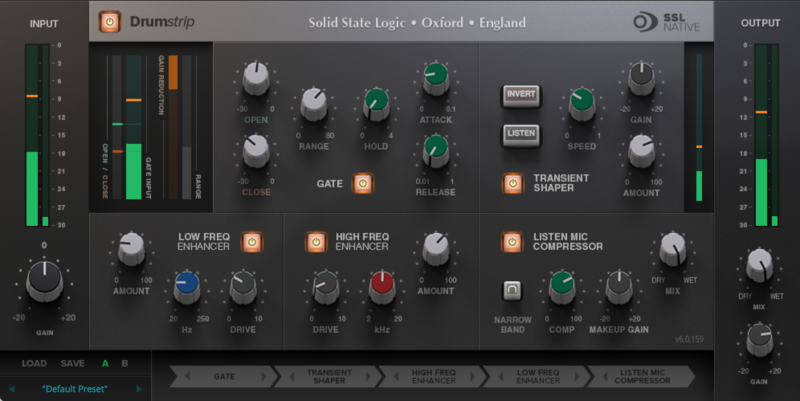 The valve emulation stage sits after the compressor in the signal path and adds a variable degree of primarily 2nd order harmonic saturation and distortion that thickens and colours the sound. The compressor can be switched between Peak or RMS modes and has a full set of standard controls including; Threshold, Ratio, Knee, Attack, Release and Hold. There are Input and Output Meters with separate kick down compression amount indication and Input and Output Level controls. There's a Gain Make Up control and switched Auto Gain Make Up mode. A dedicated wet/dry mix control facilitates parallel compression. A Side Chain input high and low pass filters can be used to trigger compression. X-ValveComp can be automated via standard DAW Automation data and has A&B Preset 'slots' with an A/B switch for easy comparison of two different combinations of settings. Intuitive tool for correcting awkward phase issues. X-Phase is an All-pass Filter plug-in that offers the user manual control and high quality response. It enables the user to apply a phase shift (sometimes called a phase offset) at a specified frequency within a signal. Unlike other filter types where the gain of selected frequencies is altered, with an All-pass Filter the gain remains unchanged throughout the signal. This is useful for fixing phase problems with microphones when recording: eg overheads causing phase problems when mixed with close mic's. X-Phase can also be used to create a comb filter by applying a filtered signal to an unfiltered version of the same signal. With X-Phase the controls are simple: a Frequency control selects the desired frequency where a phase offset needs to be applied, a Q control sets the slope of the curve of correction to be applied across the signal and a phase invert button enables the phase of the filter to be flipped 180 degrees. A separate Delay section is applied to the entire signal for broader time alignment of the signal. The Delay controls consist of a delay control which can be set to display and adjust in seconds, milliseconds, samples, metres or feet and a set of buttons for fine tuning. The overall plug-in can be set to adjust either L, R or both L&R. X-Phase can be automated via standard DAW Automation data and has A&B Preset 'slots' with an A/B switch for easy comparison of two different combinations of settings. There are Input and Output Meters with Input and Output Level controls.